A new, free, park-and-ride trolley service will launch this Saturday, December 13th. A downtown “Cultural Loop” will provide new options for audiences of many downtown arts and cultural venues. A partnership between EMTA, the Erie Downtown Partnership and Erie Arts & Culture, the Cultural Loop will provide Saturday evening services from 5-11pm as a pilot program to encourage residents and visitors to spend more time downtown in our cultural district. “Park-and-ride services have been a successful tool in encouraging participation at summer activities along the Bayfront. Our season ticket holders and subscribers have voiced a similar need for park-and-ride services throughout the year to our major venues,” states Amanda Sissem. Service will begin with Saturday evenings with the opportunity for expansion as interest grows. Free parking for the Cultural Loop is located at the Intermodal Transportation center with indoor waiting in the Rotunda. 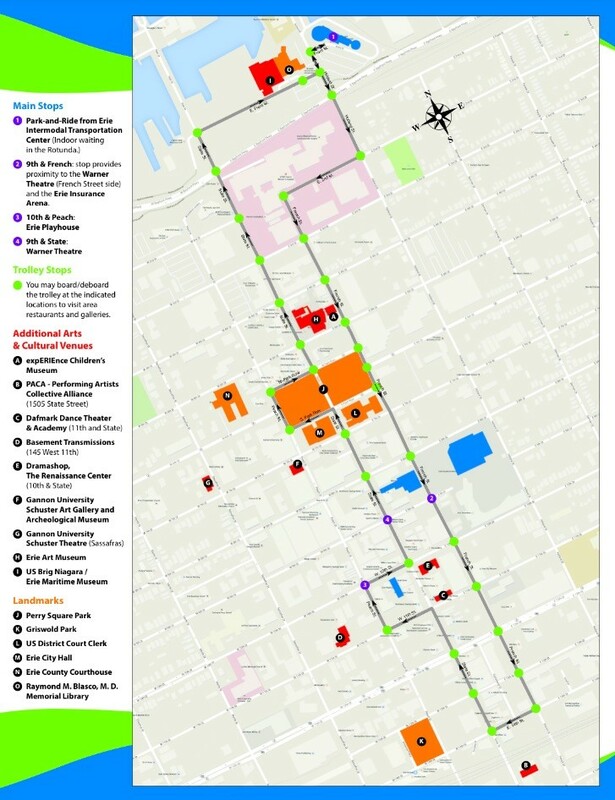 The route travels South on French Street to 14th Street, West on 14th to State, North to 11th Street, West on 11th to Peach, North on Peach to 10th Street, East on 10th to State, North on State to Perry Square, and around the Square and North on State, returning to the Intermodal Transportation Center via the Bayfront Parkway. “Erie Events is excited and proud to partner with Erie Arts & Culture to include the beautiful, historic Warner Theatre in the Culture Loop,” said Elizabeth D’Aurora, the Coordinator of Communications and Client Relations for Erie Events. “The Warner Theatre is home to the Erie Philharmonic, Lake Erie Ballet and the Erie BROADWAY Series, all of which go hand-in-hand with the Erie Arts & Culture initiative.” Main stops along the Cultural Loop include the Intermodal Transportation Center, the Warner Theatre (French Street side with access to the Erie Insurance Arena and main entrance on State Street) and the Erie Playhouse. Optional stops dot the entire route encouraging passengers to visit additional arts and cultural venues, galleries and downtown restaurants. The service runs approximately every 30 minutes between 5-11pm. 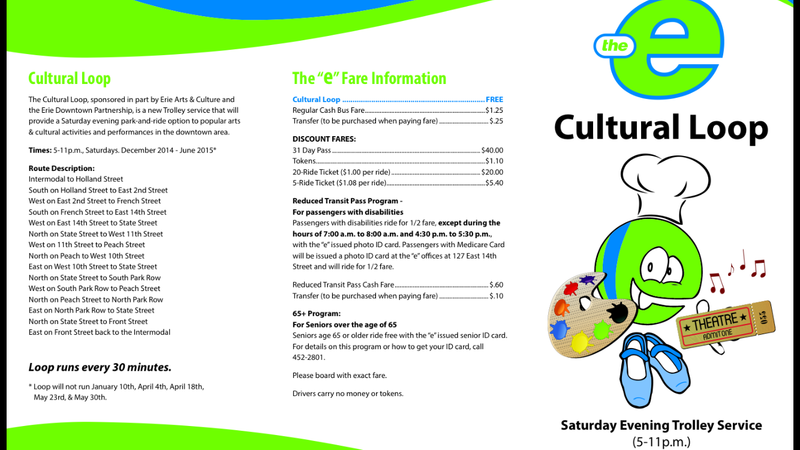 To access the Cultural Loop schedule and map visit http://www.erieartsandculture.org/events or check routes and fares at the EMTA website http://www.emtaerie.com.